Technologies - XiDrone Systems Inc.
Department 13 International Limited (ASX:D13) announced today, October 17, 2018, an exclusive partnership with Counter-Unmanned Aerial Systems (C-UAS) Intellectual Property specialist XiDrone Systems Inc.
XiDrone Systems licensed technologies go beyond counter-drone technology and include multiple verticals that exploit the basic physics of radio waves to identify signals, control radio systems, enhance data bandwidth, 5G communications and cyber security. MESMER Counter Drone System is a unique and patented drone mitigation solution. MESMER is low power, non-jamming, non-line of sight, and non-kinetic. MESMER provides a safe and effective method of protecting personnel and infrastructure from potentially dangerous drones. The key differentiator for MESMER is its ability to manipulate weaknesses in all digital radio protocols. This allows MESMER to execute sophisticated automated detection and mitigation strategies that stop, redirect, land or take control of drones. MESMER ‘s patented technology is built on open source software architecture. This ensures that MESMER can be seamlessly integrated into existing security and surveillance systems. MESMER has been designed to be integrated within a Multi-Sensor C-UAS platform and is capable of producing a threat assessment to deliver kinetic or non-kinetic mitigation options. Radios used to control drones employ well-defined techniques to begin communications and then to maintain a radio link. By adapting to the protocol used to control a drone, MESMER inserts messages that tell the drone to exit a restricted airspace, return home, or land in a predetermined safe zone. MESMER can simultaneously control drone swarms (multiple drones) that use different radio protocols. MESMER uses multiple layers of blind adaptive analysis to identify a drone’s type and radio protocol. 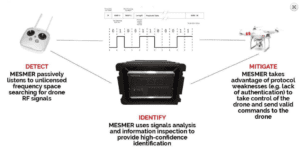 When MESMER detects a previously unidentified drone, it identifies the drone’s modulation type, format, and other signal information that may be used to redirect the drone. Detecting and communicating with a large number of drones can quickly overload the processing capability of a centralized system. But when different radio processing operations are implemented in software and spread across a network, a system can dynamically add more sensors and processors to adapt to a changing threat scenario. A virtual SDR can be assigned to each targeted drone and then migrate between processors and sensors to follow the drone as it moves through a network. Tactical Network Dominance is a technique that begins with blind signal analysis. The analysis characterizes signals, identifies radio networks, and performs a threat assessment. A tactical response includes protocol manipulations that exploit vulnerabilities in an enemy’s radio network. Messages may be intercepted, service may be denied, and the network may be penetrated as part of a broader system infiltration strategy. The distributed processing techniques in Tactical Network Dominance are adapted to protect network infrastructure and users from a variety of attacks. Radio behavior analysis and RF fingerprint tracking are techniques that a hostile entity might utilize to track and identify users. Blue Sphere helps users anonymize these signatures to reduce the threat of an attack by an outside entity. The network infrastructure is protected from infiltration and denial-of-service attacks using a distributed monitoring and authentication system that is modeled after the human body’s immunological functions. Low Probability of Interception / Low Probability of detection (LPI/LPD) protects communication links from eavesdropping. Mesmer’s approach breaks all the rules by using other peoples’ communication signals to carry our information. The information is encoded in signal distortions that are normally filtered out of received signals. Advanced forms of this technique are implemented in MIMO channels. The radio spectrum is a scarce resource, particularly in the lower frequency bands which have the best propagation characteristics. A user in a first network can repurpose scheduled radio channels to avoid interfering with the first network. When a downlink channel is assigned to a cellular user, only that user device is listening on that channel. This enables the user to concurrently employ the assigned channel for other communication links. Uplink channels are repurposed by embedding a second network’s transmission protocol in the data payload of the first network’s transmission frames. Cooperative- Multiple Input Multiple Output (C-MIMO) is also known as Virtual MIMO, Distributed MIMO, and Network MIMO. C-MIMO solves some of the most important problems in radio communications and dramatically reduces the network operator’s Op-Ex and Cap-Ex. There are two basic forms of C-MIMO: Server side and Client side. Server-side C-MIMO is employed in a distributed antenna system, such as multiple cellular base stations that are connected to a central processor, or Cloud. The processing exploits the natural scattering environment to function like a giant lens. Buildings, hills, and trees focus radio transmissions to produce a tiny coherence zone at each client device. This allows the network to serve each client with the full spectrum, instead of dividing the spectrum (and thus the data bandwidth) between users who join the network. Client-side C-MIMO can work in tandem with server-side C-MIMO to enable client devices to share each other’s coherence zones. The sharing results in the unusual condition that as more users join the network, the available data bandwidth increases rather than decreases. Also, since users become part of the network infrastructure, coverage and network capacity can dynamically adapt to demands without costly capital expenditures. Cooperative-MIMO is expected to be the operating framework for next-generation Counter-UAS because it is a Cloud-based computing system that operates with a distributed sensor network. This enables novel capabilities that enhance Counter-UAS, such as highly localized electronic countermeasures against targets, new artificial intelligence paradigms, and effective responses to UAS swarms. Cooperative Subspace Coding (CSC) is likely the most efficient form of Linear network Coding. It improves network efficiency for all data communications, including terrestrial wireless networks, satellite networks, and wired networks. Published results show a 5- to 20-fold increase in data bandwidth. CSC also facilitates Cloud storage and channel bonding, and enables highly efficient file-sharing networks with less management overhead. CSC benefits the Counter-UAS market by enhancing the bandwidth and reliability of both fronthaul and backhaul networks that are necessary for communicating large volumes of data in Counter-UAS sensor networks. Using a single line of code in our software-defined radio, Department 13 reshapes transmitted signals to reduce their dynamic range. This results in many benefits, including longer battery life, less-expensive power amplifiers, reduced interference, and improved performance. Single Carrier FDMA is important for drone communications and any other battery-powered wireless devices. Coordinated Multipoint is an essential part of the LTE-Advanced cellular specification. Coordinated Multipoint aspects of Cooperative-MIMO will be essential to all distributed networks, especially Counter-UAS networks. Cloud Radio Access Network (C-RAN) is one of the most important elements of 5G network architecture. C-RAN greatly reduces the network operator’s Op-Ex and Cap-Ex. C-RAN provides an efficient framework for Artificial Intelligence in Counter-UAS by efficiently partitioning signal processing operations between the network edge and the core network. This optimizes processing and bandwidth resources. Airborne Relays is an innovation in Cooperative radio networks that uses highly mobile airborne platforms as a distributed sensor network. This is essential for drone air-traffic control, next-generation cellular networks, and Counter-UAS. Like a swarm of birds, each UAS employs an autonomous navigation system that uses a simple rule base to avoid collisions and to optimize flight patterns. This rule base is adapted to optimize radio channels, detect target UAVs, and perform electronic countermeasures. Airborne relays may be quickly deployed. When used to provide wireless network services, the cost of Cap-Ex and Op-Ex are a fraction of traditional networks. Based in Columbia, Maryland, Department 13 (D13) was founded in 2010 by a team of former military operators, scientists and engineers. The team applies proprietary innovative advanced technology to emerging requirements. D13 is developing cutting-edge software and communication systems that have the potential to transform the networking and communication fields. D13’s technology is also transforming current applications in drone defense, mobile phone IT security, and secure enhanced Android phone systems. D13 is engaged with multiple counter UAS projects that provide strategic solutions for civil, military and commercial security requirements. D13 has a substantial intellectual property portfolio covering wireless protocol manipulation and communication networking software. The company has applications in drone defense, local area and wide area cellular communications and networking, enhanced data bandwidth for all digital communications, cyber security for mobile devices and sophisticated RF technology applications (radiometric). For more information about D13, please visit www.department13.com or follow the company on Twitter (@D13ASX), LinkedIn and YouTube. Contact us today to learn more about our partnership that is adding global value to the drone industry!